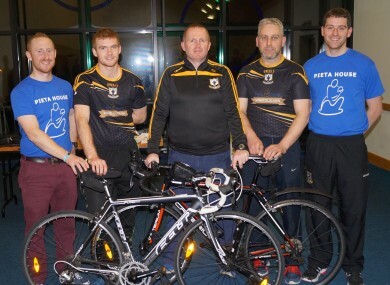 A GAA CLUB from Galway are cycling from Croke Park to their pitch this Saturday, hoping to raise funds for suicide and self-harm awareness charity Pieta House as well as their club along the way. It’s a 186km journey from Croke Park to Killimor, and they’re heading via Athlone. 55 participants will leave GAA HQ at 7.30am on Saturday, and 30 more including An Taoiseach Enda Kenny will link up with the group in Athlone for the leg home to the east Galway club. The idea came about six months ago, according to Killimor secretary Ger Lyons. It all started as a fundraising concept for the club, but it’s stemmed into much more than that alone. “We wouldn’t be from a cycling background as such or anything like that, but cycling’s getting big around here,” Lyons tells The42. ”We married that with getting people in the GAA club involved and we just saw an opportunity there. Like every other parish and club the width and breadth of the country, we’ve been affected by suicide over the last few years in some shape or form. So we’re just trying to keep mental health constantly in the background as well. “There would have been a handful in the area involved in cycling beforehand who are participating. A lot of other people, see this as a fitness element, as something they might keep on. The club themselves have been working hard on their mental health and well-being initiative over the past few years, and have worked closely with Pieta House in the past. Lyons himself contacted the organisation a few years ago and from there, they organised getting their ‘Mind Our Men’ logo on the jerseys. Earlier this year, the club also organised a well-being evening in Killimor presented by former Galway players Iggy Clarke and Justin Campbell for the people of the parish and surrounding areas. “In hurling, we try to look out for each other, we just try to keep it going in the community as well. “Because we’re the fabric of the community, we’d find ourselves at the centre of the community and we’re the biggest club in the rural parish, we’re in a position to be able to help out and put word out there with regular meetings and so on. “I made contact with Pieta House a couple of years ago and we started by simple things like putting names and logos on jerseys, and next thing, this came about towards the middle of last year and we aimed for this year. Pieta House have been very helpful with anything we needed in the meantime. They’ve been extremely supportive. What we want to do is keep the word out there that there’s always someone to talk to, we hope we show that as a hurling club ourselves that we’re all there for each other as much as we can. “Of course we give out and at meetings people might be giving out about people and the day of the game, but people’s lives and mental health and everything like that is much more important. Of course, the funds raised will be used within the club too. “We’re trying to upgrade our facilities and we’re just after erecting a top-quality lighting system and it’s taken huge work from various committees over the last couple of years to get that done. We’re marrying the whole lot together now, I suppose showing the light of our new facilities, as well as Pieta House showing the light to help people. “Pieta House will be getting a percentage, and we’ll be getting our percentage as well for the club. I suppose it’s an overall community effort. The camogie club will be using it too for years to come and we hope it will be of benefit to Killimor and the surrounding east Galway area. And people can still donate. See the Facebook page for details or contact anyone in the club. Email “Croker to Killimor: Galway GAA club partner with Pieta House for 186km fundraising cycle”. Feedback on “Croker to Killimor: Galway GAA club partner with Pieta House for 186km fundraising cycle”.